PraxisNow will directly certify participants who successfully complete a challenging SEO process exercise during the final programme workshop. 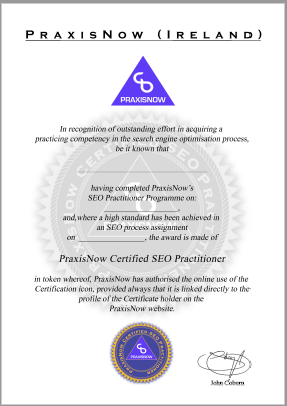 Successful participants will be awarded the “PraxisNow Certified SEO Practitioner” Certificate. Be warned . . . it won’t be easy! 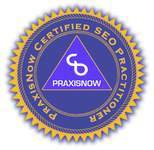 They will also be authorised to use the linked certified SEO practitioner icon on their digital collateral. Please note date changes in May. Please register early as there is limited availability. certified SEO practitioner icon on their digital collateral. This SEO course is designed for those who are responsible for SEO strategy, execution and results in any enterprise, large or small. It is an intensive 4-mornings over 4-weeks SEO training course with inclusive task mentoring between workshops for those who can execute and the course progresses. It is especially designed for marketers, digital managers, content managers, corporate product managers and direct-action business owners. Combining the latest techniques in machine-learning SEO with tactical insights into the wider digital marketing environment, the programme is the SEO course of choice for many of Ireland’s digitally successful organisations. Not confined to tactical SEO execution alone, the role of SEO in areas such as content marketing and digital strategy is explored. Participants will leave with an implementation competency in SEO that will set them apart. Please send me the latest updates for this programme. If you would like to receive a telephone call about this programme, please enter your telephone number here. Please note that as this is a small-group programme, advance payment is required upon registration (direct bank transfer or PayPal) before your place can be confirmed. As space is very limited, please call to confirm availability. “One of the best-taught courses I’ve attended. . . is immensely knowledgeable and well organized . . . group exercises and open discussions very beneficial . . . provided opportunity to practice the concepts and learnings from each module . . . I highly recommend this course to all with any level of SEO ability”. In recent years, traditional keyword-based SEO has been progressively downgraded with new rules based on “semantic” or intent-driven search results. Driving these new results are the latest machine-learning algorithms developed at Google and Microsoft which assist its interpretation of the “true intent” of the sarcher. Effective SEO implementation now requires you to align your content to the search intentions of your targeted audience – not just target “keywords”. This change is a radical rewrite of the traditional book of SEO. The process of SEO sits at the very heart of digital marketing strategy. It is the key that unlocks the power of content by empowering content to “independently locate it’s targeted consumer“. Note: Whether you are a beginner in SEO or a seasoned SEO “traditionalist”, this SEO course will prove invaluable to you as you as a roadmap to modern SEO execution. “This is a great course – full of practical, myth-busting information. I would highly recommend it to anyone looking to learn more about SEO”. Who Should Attend This SEO Course? Whether you are new to SEO or have had some experience with it, this SEO course will take you on a journey that will stay with you for many years. After the first 2 SEO workshops (stage 1), all participants will be on a par in terms of their core understanding of current best practice in SEO implementation. Thereafter, during Stage 2, the more advanced ideas of semantic alignment of content, the role of SEO in content marketing and other ideas will be covered. Several disciplines including marketing, business, sales and IT have attended thus far. The four SEO workshops span the entire SEO execution competency spectrum. From fundamental SEO process, through to the best SEO tools and execution methods associated with more advanced SEO ideas – all are covered. By design, this is a small group, roundtable programme, typically consisting of between three and eight participating companies, using live demonstrations, supporting slides and interactive discussion. Please see the top of this page for next course dates and contact us on 01-2360076 to confirm place availability. Although not required, for participants who are in a position to implement SEO as the programme progresses, email and telephone based task mentoring between workshops is included in your registration fee. This will continue for one week after the final workshop date. “. . . highly recommend . . . covers both basics and more advanced practice . . . especially enjoyed learning about the useful tools . . . myth debunking . . . competitor analysis sections very interesting . . . would advise anyone considering an online presence to attend this course in advance”. Learn SEO progressively in 4 mornings spread over 4 weeks as part of a round-table group of like-minded businesses. During stage 1 alone (first two mornings), you will learn current best practice in SEO and will be capable of significantly boosting your website’s organic performance – even before you enter the Advanced stage – the second two mornings. To remove the execution barriers of effective SEO – irrespective of technical knowhow. To build SEO competency from early stage awareness through to an execution level proficiency that will empower you to effectively engage real-world SEO challenges. To provide a level of specialist training in very specific SEO topics that is not readily available elsewhere. To provide you with a comprehensive, structured SEO implementation process that will get you results as it is implemented. To help you execute on SEO in a way that sets you apart from your competitors over time. To provide mentoring guidance during the programme for those who can simultaneously implement. 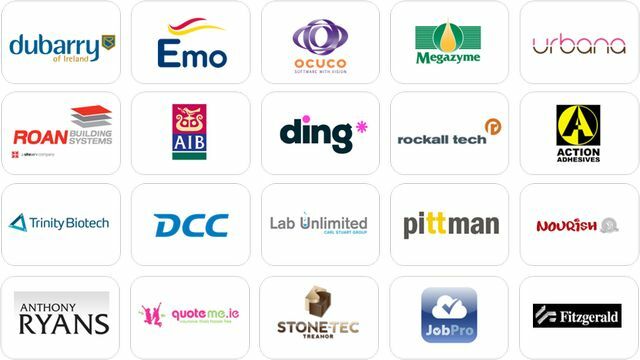 To give Irish-based corporations an alternative to off-shore outsourcing by boosting competency here at home. Only one of the following offers may be taken up per company per course. If you wish to take up one of the following offers, please advise your preferred offer at time of registration.